We learned during our residency in Latvia two fascinating traditional belt weaving techniques. We are currently experimenting with these techniques and making reinterpretations of the traditional belts using electronics. We hope that the reinterpretations will revive some of the old stories associated with the belts. Our main inspiration for the reinterpretations is the Lielvārde’s belt (Lielvārdes josta), which carries in its history many interesting and even mystical stories. The numerous patterns and unique pattern combinations of this belt can be associated with the origin of cosmos and finding a personal symbol among the patterns. Some of these stories may have obtained extra color in the course of telling, but nevertheless, they inspired us to take the cosmic aspects under a more thorough investigation. 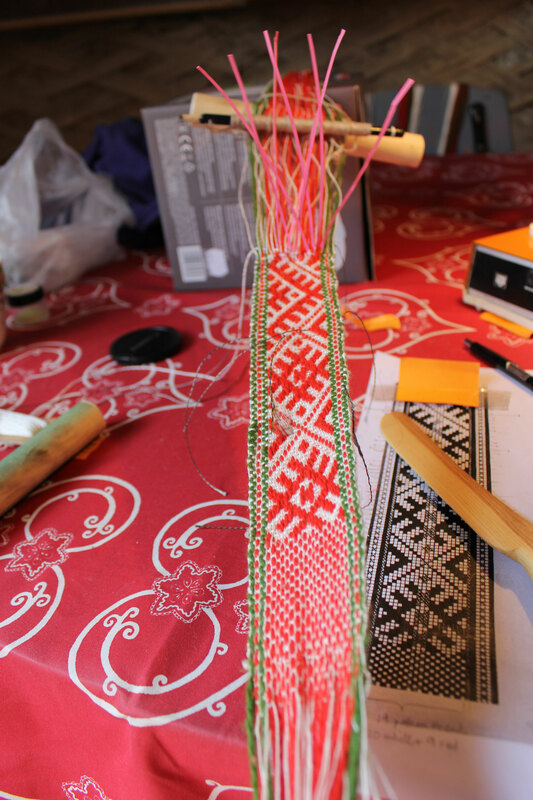 You can read more about the traditional Latvian belts, and see below what we are currently working on. The traditional belts are precious artefacts, which the wearer can carry with pride around their waist. In the old days, this might have been taking place on the streets of a small Latvian village, or in the midst of a Midsummer celebration. But how would it be to walk with such a belt today in Riga, or another city like Berlin or Helsinki? With what kind of energies could the belt connect there, surrounded by the contemporary urban landscape and technology? These contemplations led us to the idea of making a belt that would react to the electromagnetic waves around its wearer, serving as a weaved antenna. The changes in the realm of the invisible electrons could trigger subtle changes in the belt, reinforcing the feeling of connectedness to the electromagnetic sphere. Below are some snapshots of the ongoing work related to experimenting with the card weaving technique in combination with conductive yarn and optic fibers – the former provides the antenna input, while the latter can be used to light up the belt accordingly. The card weaving technique, although not used for making the Lielvārde’s belt, works well for weaving somewhat stiff fibers. More updates of the experiments will follow soon! The pattern used in the experiment is a modification of a 30 card pattern from Latgale, which we got from our weaving master Lilija. Some of the warp yarns were changed to optic fibers and conductive yarn. Stripes with optic fibers and conductive yarn. More strands of the optic fibers and conductive yarn were used as compared to the regular woolen yarn in order to obtain similar thickness of the stripes. Threading the cards for weaving. Weaving the belt. The weaving set up was fixed in this case to a table with clamps, as the optic fibers needed to be tensioned tightly. Practicing to mount LEDs on the ends of optic fibers. Taking these thoughts forward into e-belt weaving, we started exploring how touching the patterns could trigger subtle responses in the woven belt, thus making the wearer an active participant who reveals the electrical energies of the otherwise traditional-looking belt. We also wanted to look into implementing energy-harvesting possibilities on the belt where the person would not only trigger the energy flow but be the source of it as well. Our first experiments involved finding ways of integrating electroluminescent materials such ‘EL foil’ into the warp of the belt. EL foil is a light emitting surface that can be cut or reshaped and still be lit up evenly along its entire connected surface. We tried to cut the EL foil in strips and weave it along with the warp threads. Although the strips cut were quite thin, the two materials – stiffer EL foil and soft yarns did not prove to be a compatible match. The thin strips of the EL foil did not work well with bending like the yarns in a woven structure and broke easily, damaging the electroluminescent surface. We are continuing experimenting with larger EL foil surfaces cut into the shapes of the motifs in order to seamlessly weave them into the belt using the Backstrap loom method we learnt from Laima. Since the warp threads are picked individually by hand for each row, this weaving method allows for altering the pattern on-the-go and creating negative spaces within the pattern between the red bulkier threads, making room for EL foil cutouts to be fitted in. Below are some more detailed pictures of the experiment. This work is in progress and we will add more about the results soon. Belt from further away when the EL foil is ON. The surface only looks slightly brighter making the effect more subtle.